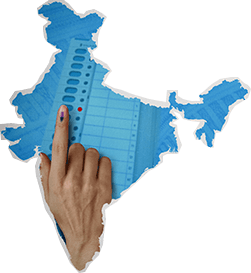 For the first time voters in the state, employees who are drawing their salary from the state exchequer would be appealed through SMS about becoming a voter and to exercise their voting rights. Chandigarh: In a bid to reach out to prospective voters, especially first-timers in Haryana, catchy slogans have been printed on the admit cards issued to over seven lakh students appearing in the secondary and senior secondary examination of the State Board of School Education. "The slogan 'Loktantar ke Imtihaan Ki Tayaari, Vote Banana Pehli Zimevaari' has been printed on the admit cards issued to 7,65,549 students who are appearing in the secondary and senior secondary examination 2019 of Board of School Education Haryana and Open School, to convey the message to the prospective and first-time voters to get their voters' card made," Haryana's Chief Electoral Officer Rajeev Ranjan said here. "Haryana has become the first state in the country to reach out to the new voters in this innovative manner," he said. It was also informed in the meeting that for the first time voters in the state, employees who are drawing their salary from the state exchequer would be appealed through SMS about becoming a voter and to exercise their voting rights. He said for the Lok Sabha polls for 10 seats in Haryana, the eligible citizens who are 18 years old or above as on January 1 this year could get their voters card made till April 12 this year up to 3 pm.